Let your guests have their own fun on the side! - DOUBLE-STRIP FILMSTRIP (4x6) layout with a custom message or logo. 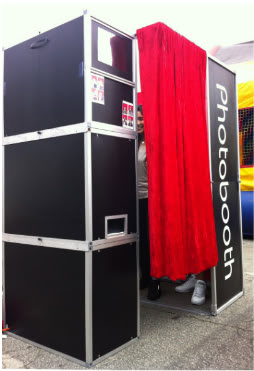 For Example "Liam and Jenny - July 18, 2015"
- ENCLOSED & OPEN BOOTHS for that "classic booth" feeling or open it up and use your venue as a background! - DVD of full resolution images of all photos after the event. - PASSWORD PROTECTED GALLERY of your images for your guests to view them all on the web. Photo Guest Book With all the great photos your guests are taking in your Photo Booth, it's good to have a place to keep them! A photo guest book allows your guests to write you notes and place their photos along side their notes. Photo Guest Books start in a simple white and can be made as customized as you'd like! Photo Guest Books come with tape and pens.